La Victoria Soft Taco Tortillas Only $0.78 at Rite Aid! Rite Aid is having a deal for La Victoria Soft Taco Tortillas ,Use Manufacturer Coupon to crab each item for $0.78! 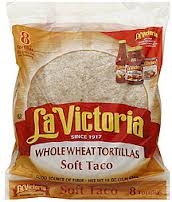 1.La Victoria Soft Taco Tortillas, 8 ct for $1.78. 3.Final Price for this item $0.78! Free L’oreal Hair Care Products at Rite Aid! Smart Ones Entrees $0.95 at Target!